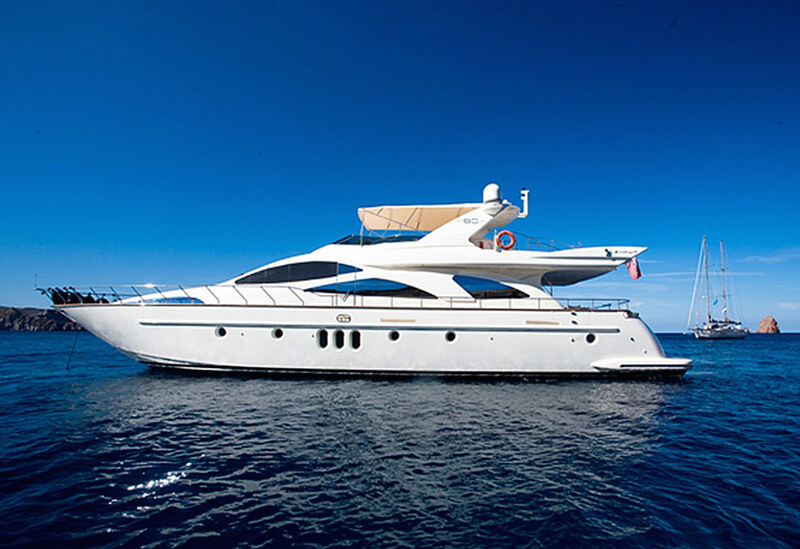 Luxury motor yacht TRANQUILITA was built in 2004 by the renowned Italian shipyard Azimut and measures 24m (78.9ft) in length. 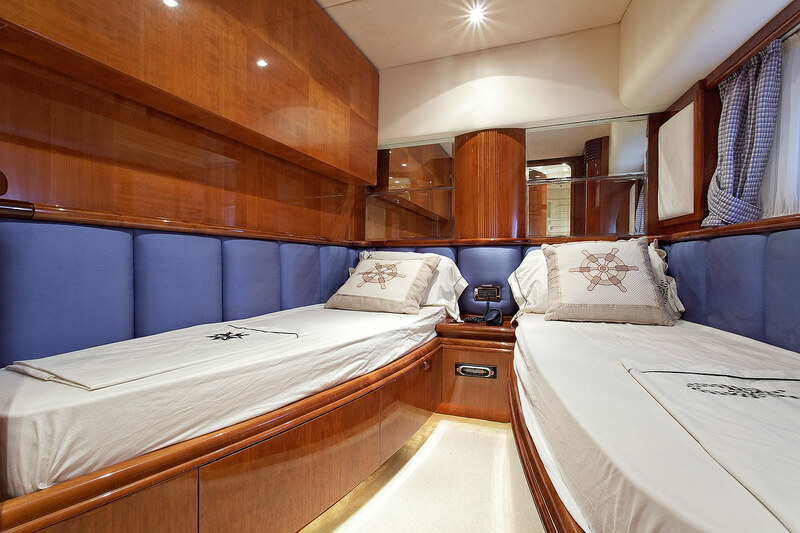 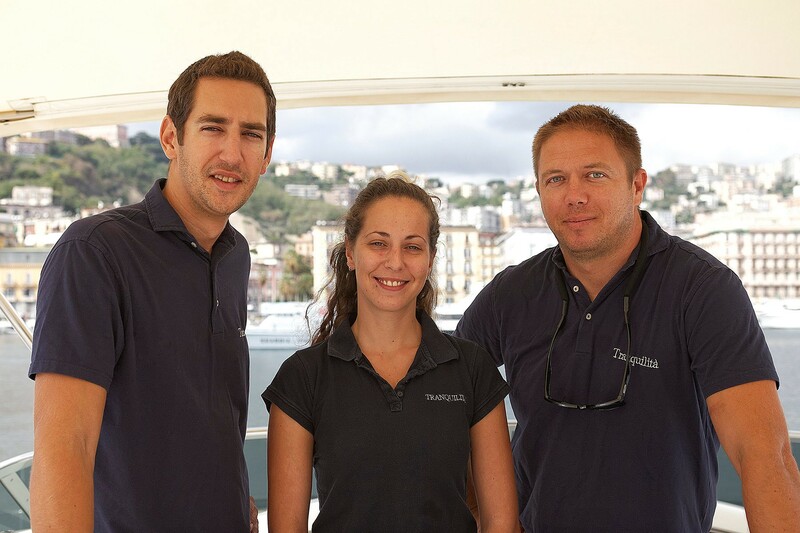 Crewed by 3 professional crew members, M/Y TRANQUILITA offers deluxe charters for up to 8 guests. 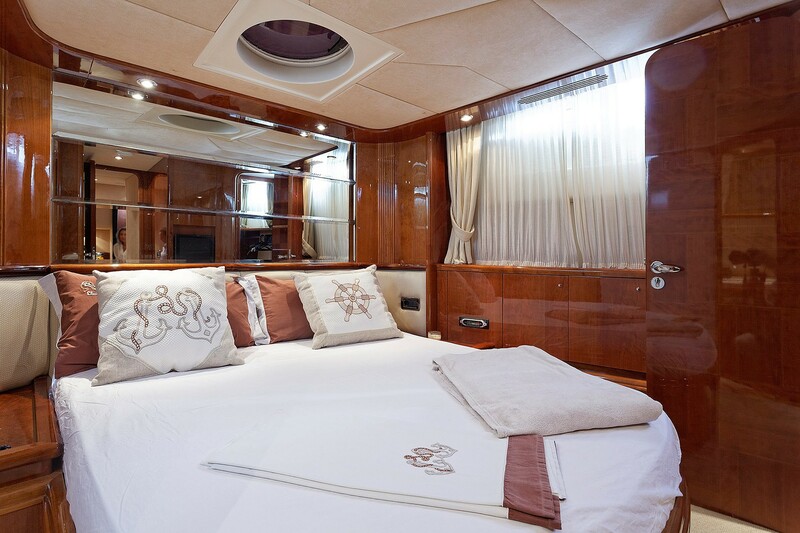 Charter yacht TRANQUILITA features a timeless and elegant interior décor. 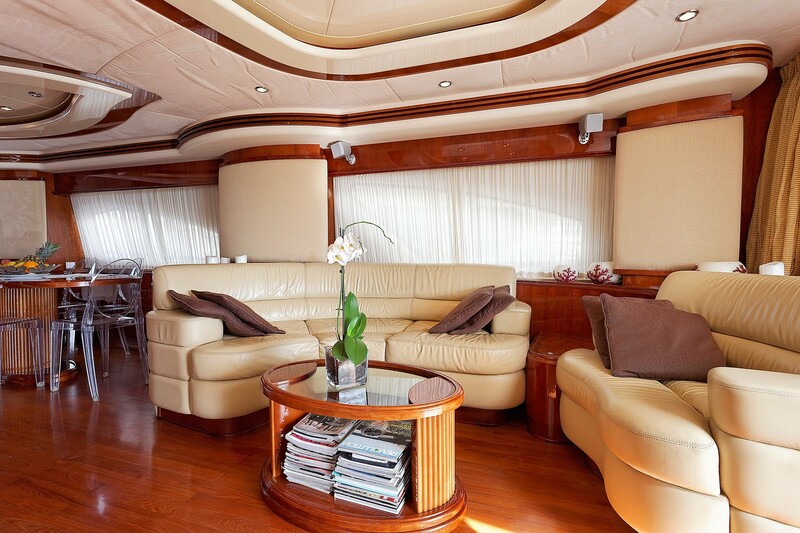 Her stylish interiors boast warm high gloss woods, fine neutral leather furnishings and lavish marbles. 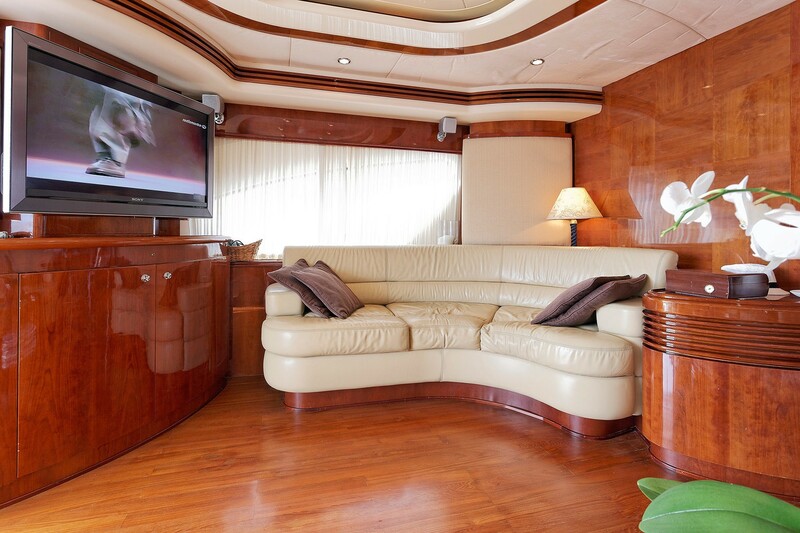 The salon is ideal for entertaining and relaxing, offering 2 sofas, an occasional chair, coffee table and full entertainment systems. 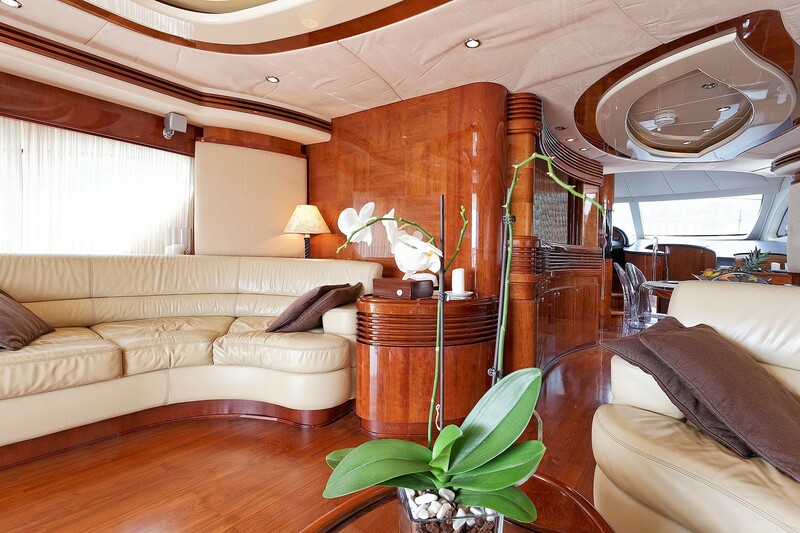 Forward of the salon is the formal dining table, flanked in chic transparent chairs, for up to 8 guests. 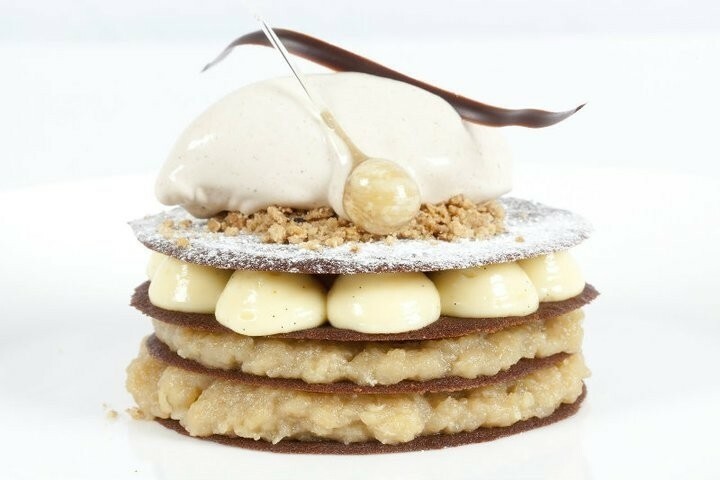 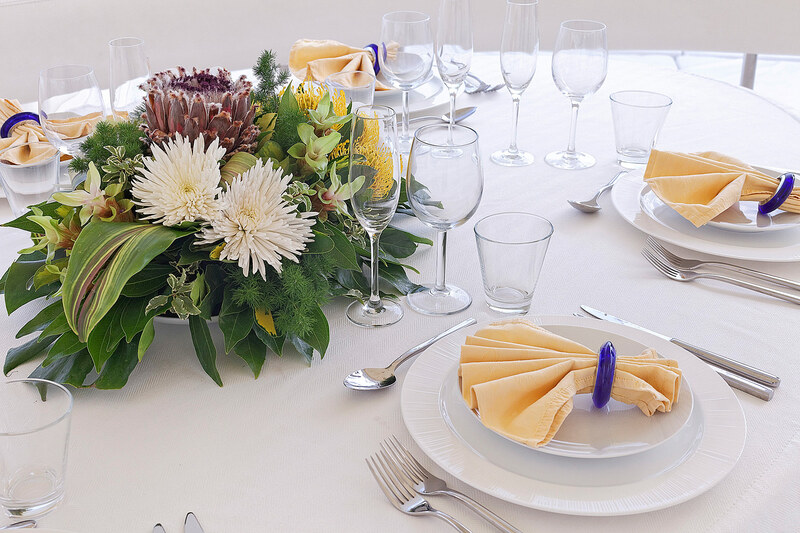 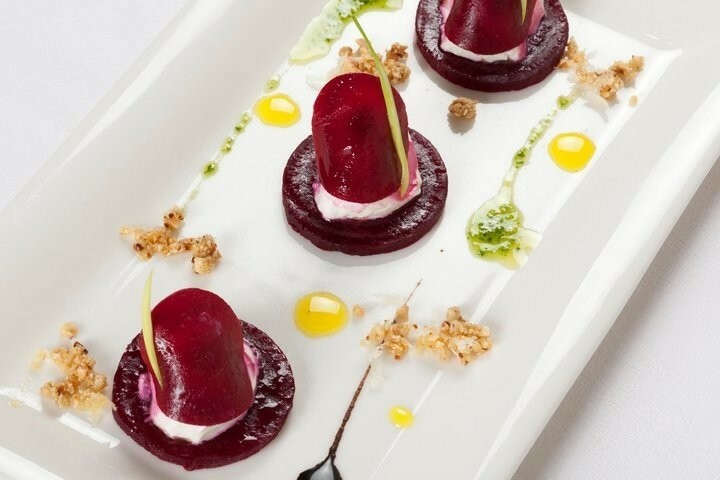 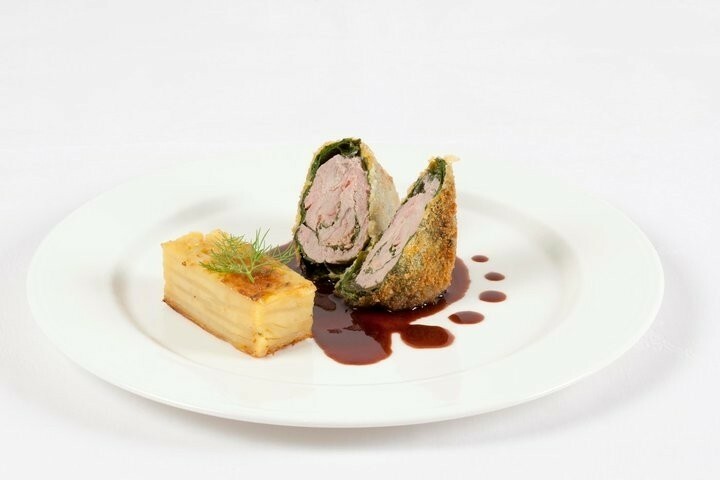 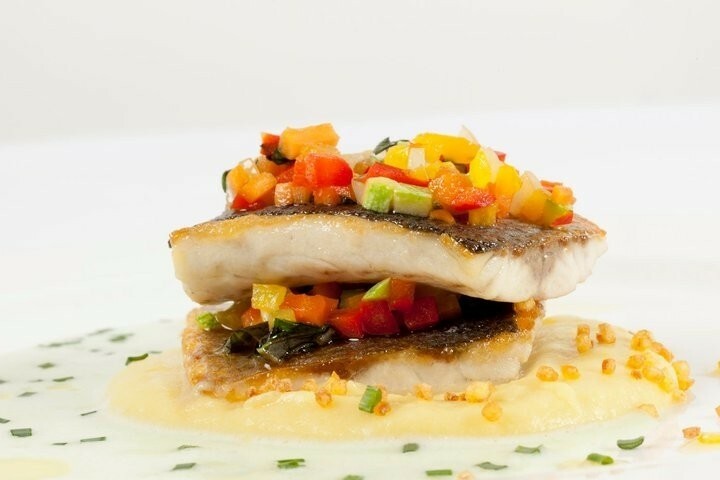 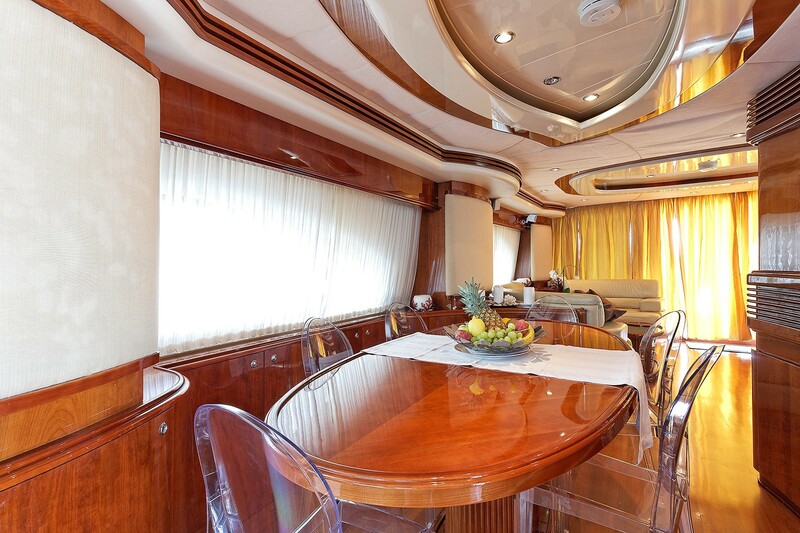 Opposite of the formal dining is the modern well-equipped galley, ensuring delectable cuisines. 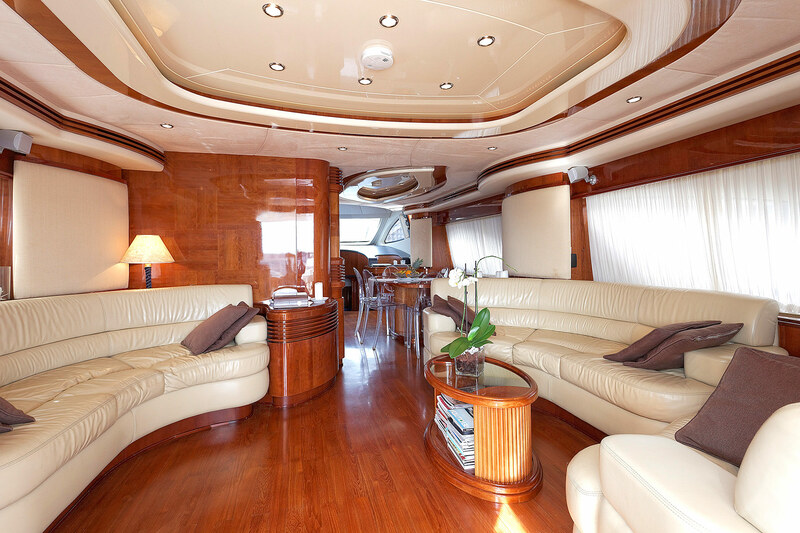 Surrounding windows and wide sliding glass doors aft provide spectacular views and plenty of natural light. 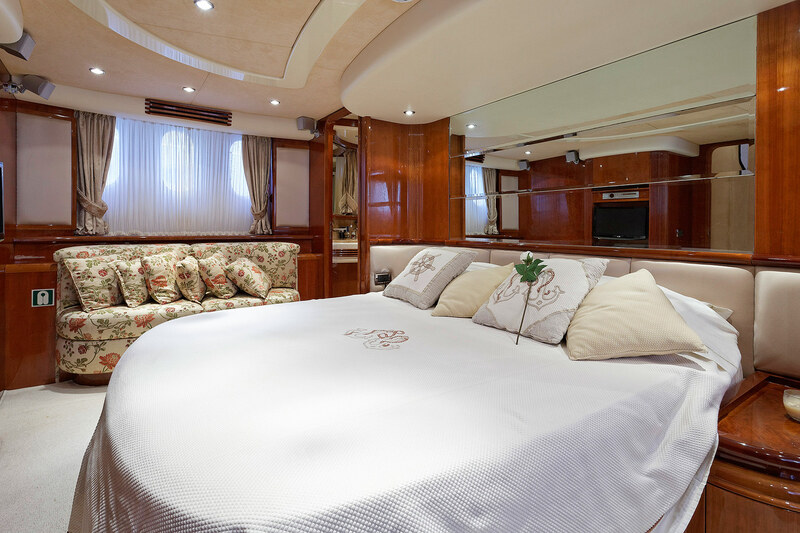 Below decks are 4 tasteful cabins, offering accommodation for up to 8 guests. 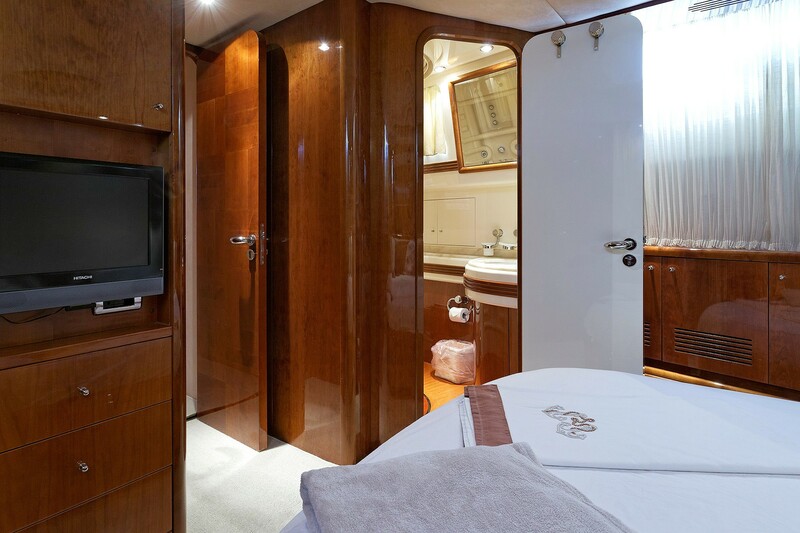 Each cabin is light, airy and boasts private en-suite facilities. 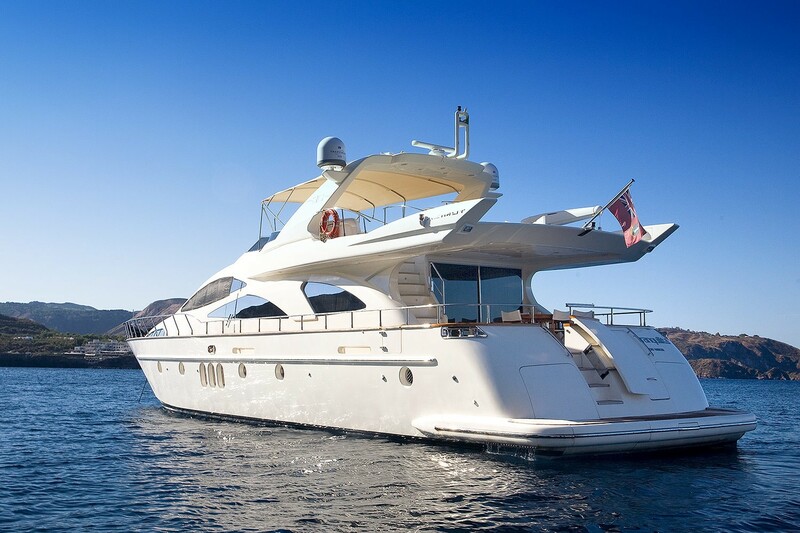 The Azimut motor yacht TRANQUILITA features spacious exterior living on 2 decks. Adjacent to the salon is the aft deck, with shade and an alfresco dining option. 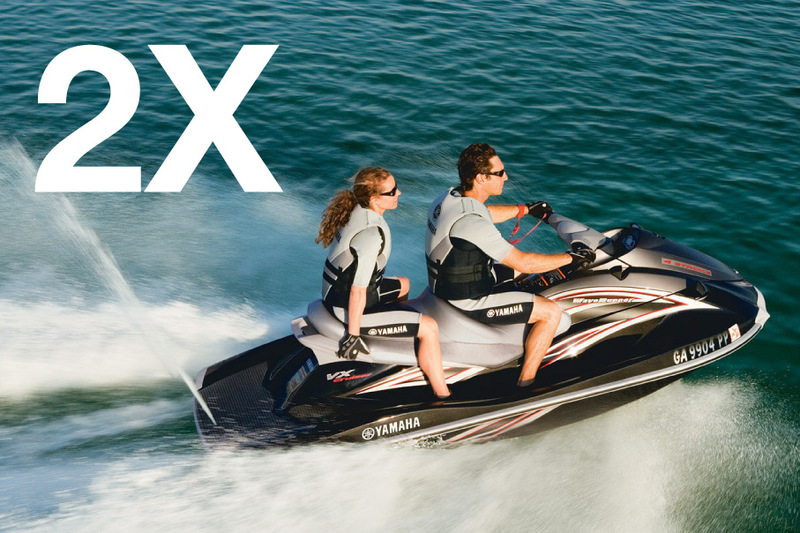 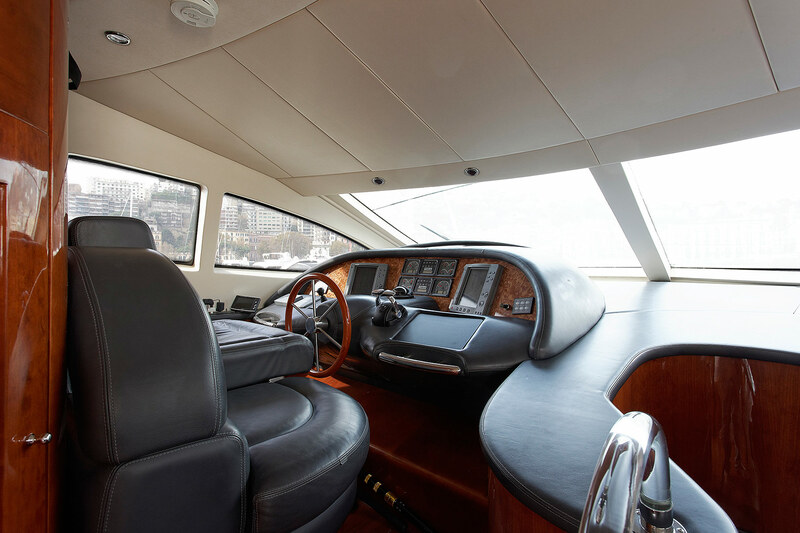 Centered steps lead effortlessly to the extended swim platform and tender garage, complete with a 3.5m (11.5ft) tender and 50hp engine, 2 jet skis and water toys. 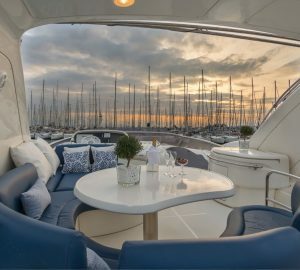 For the sunlovers, the bow is the perfect relaxing area, boasting a generous double sunpad. 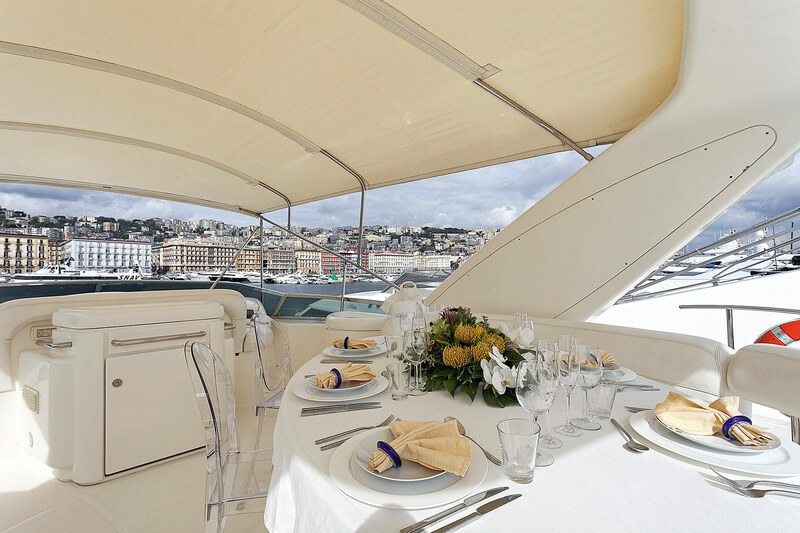 On the upper deck, a further alfresco dining option seats 10 guests with ease and offers optional shade, ideal for casual entertaining. 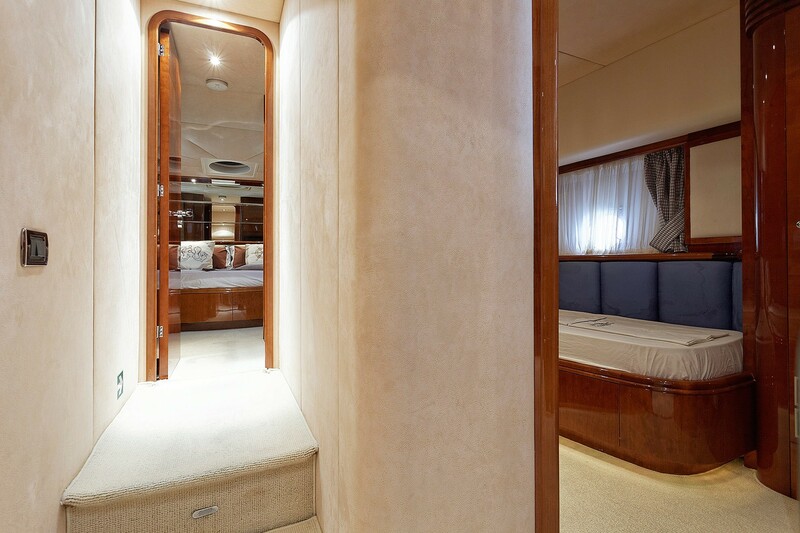 M/Y TRANQUILITA has a sleek planing hull design. 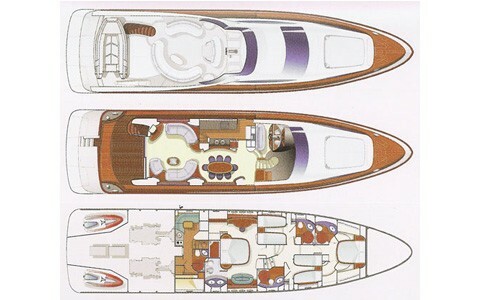 Powered by 2 x CAT 1,570hp engines, she is capable of 24 – 26 knots. 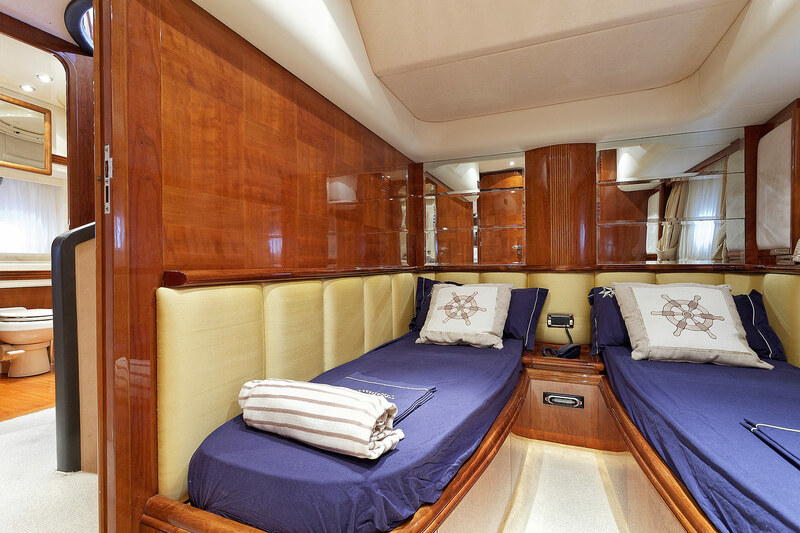 Luxury crewed charter yacht TRANQUILITA accommodates 8 guests, in 4 well-appointed cabins. 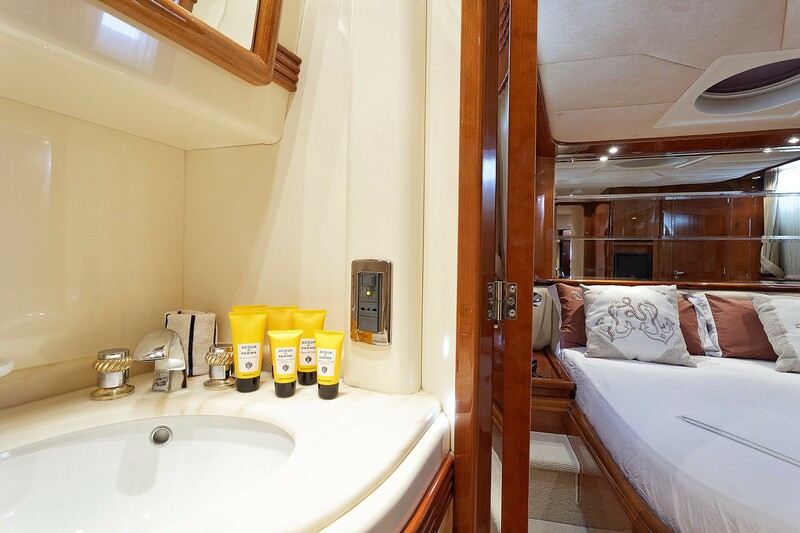 The master cabin is amidships and full beam of the yacht, featuring a king size center lined bed, sofa, vanity, walk in wardrobe, Sat TV and en-suite with his and hers marble sinks. 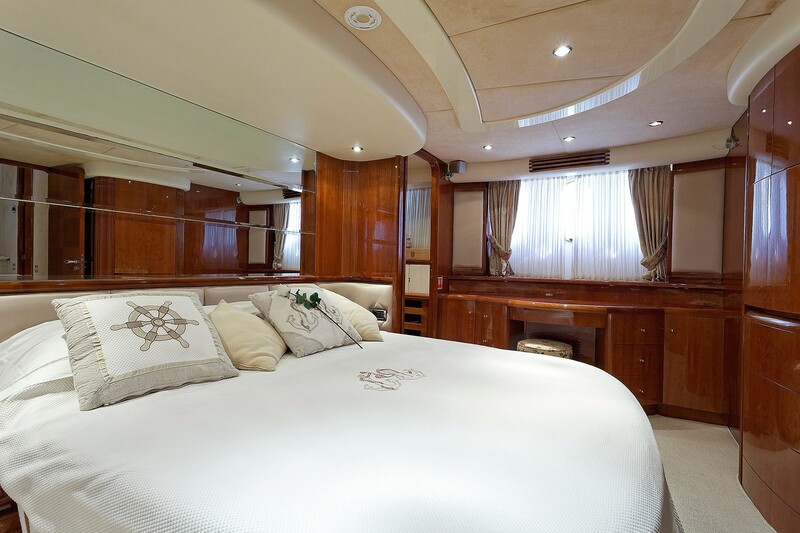 The VIP cabin is forward and full beam of the yacht, with a center lined queen size bed, closet, Sat TV and en-suite facilities. 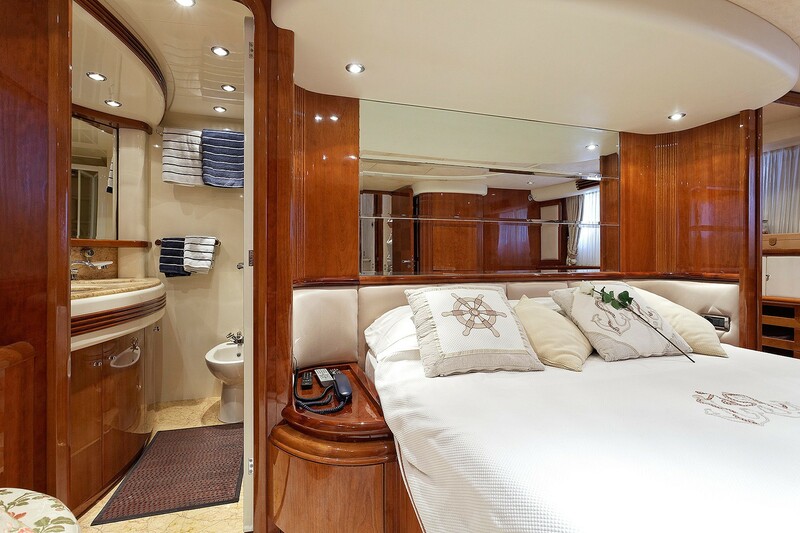 Two guest cabins each offer side by side single beds, a closet each and private en-suite facilities. 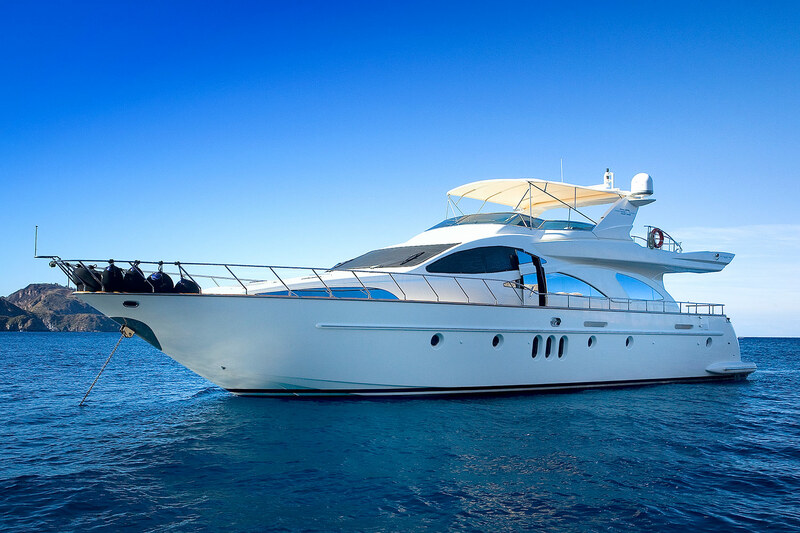 M/Y TRANQUILITA is fully air conditioned throughout. 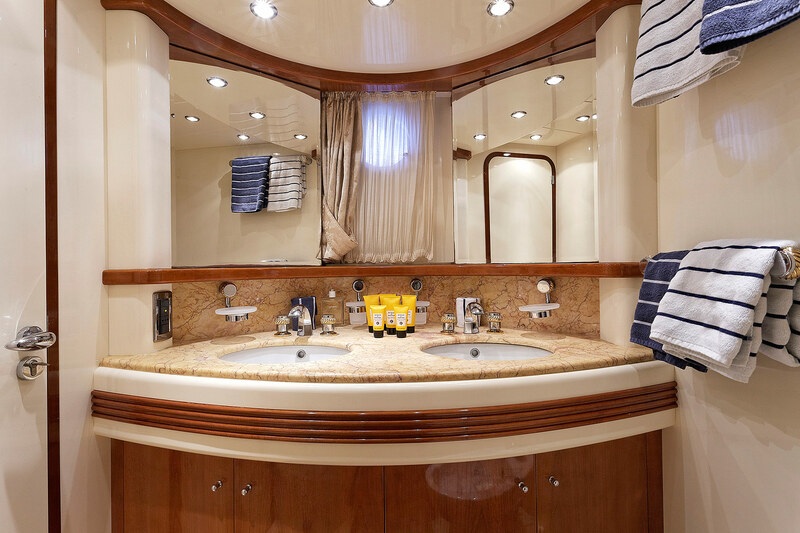 Her crew of 3 has separate crew quarters, ensuring optimum guest privacy.